Christianity reached the British Isles through Roman colonisation in the first and second centuries AD and continued within the tribal and cultural mix after the Roman withdrawal in 410 AD. There is archaeological evidence of a Christian presence at Whithorn associated with Ninian, a shadowy fifth century figure about whom little is known. More information exists about Columba who, fleeing Ireland, made landfall on Iona in 563 AD. There with his attendant monks he established a community and, using the network of sea and sea-lochs, evangelised as far as Inverness. 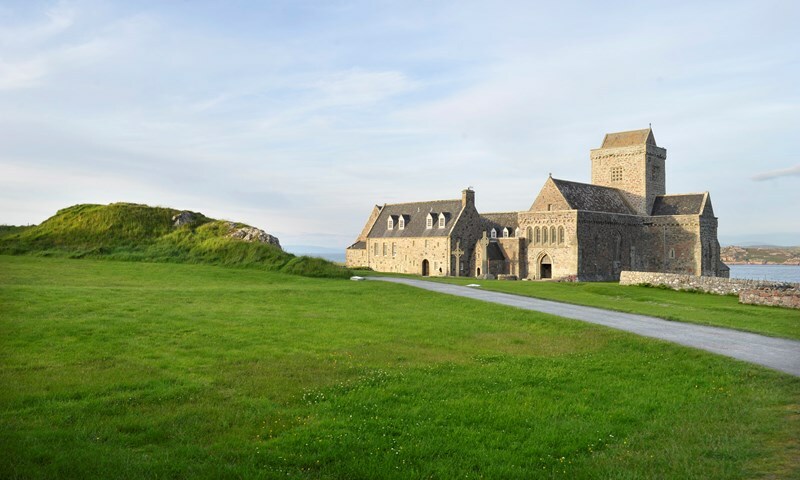 He also created a scriptorium where sacred texts were copied and it is entirely possible that the Book of Kells was produced on Iona. Another famous name associated with these early beginnings is Kentigern, also known as Mungo, patron saint of Glasgow, whose original church is believed to have stood on the site of today's Glasgow Cathedral. He and Columba were almost exact contemporaries. Columba died in 597 AD. That same year Augustine arrived in Canterbury, sent by Pope Gregory to evangelise, but also to organise. By the mid-sixth century there were two Church traditions within the British Isles - Ionian and Roman. The former reflected the Celtic pattern associated with Columba; the latter conformed to the customs of Rome. Two specific points of disagreement involved how the date of Easter was calculated and the style of tonsure, that is, the manner in which monks shaved their heads. To resolve things a synod was held at Whitby in 664 AD where the Roman practice prevailed; though another fifty years would pass before Iona complied. The early Church was based around five major episcopal sees - Rome, Constantinople, Antioch, Jerusalem and Alexandria, but in 1054 a major split occurred. Known as the Great Schism, this saw the Church divide in an east-west split. Based on its association with the apostle Peter the Roman Church asserted a primacy which the eastern churches would not accept; thus today we have Catholic and Orthodox, Pope and Patriarch. Scotland lay within the western Catholic Church and famous names from this period include the saintly Queen Margaret, wife of Malcolm III and mother of three Scottish kings - Edgar, Alexander I and David I. This was the period which saw the building of St Giles' in Edinburgh, St Andrews Cathedral, and the great abbeys of Iona, Paisley, Arbroath, the Borders and elsewhere. In 1378 the Catholic Church found itself divided with rival popes in Rome and Avignon. England remained loyal to Rome but the Scots recognised the Avignon pope, Benedict XIII who in 1413 granted the papal bull which established Scotland's first university at St Andrews. Four years later the papal schism was healed and in 1472 Pope Sixtus IV raised the See of St Andrews to an archdiocese. Twenty years later Pope Innocent VIII accorded the same honour to the See of Glasgow. The Mediaeval Church had great power, but it also had its critics. One of the issues with which the first Archbishop of Glasgow had to deal was an Ayrshire movement which was challenging Church teaching. Known as 'the Lollards of Kyle' they not only rejected traditional practices; they positively affirmed counter-arguments in favour of priests being allowed to marry (as distinct from turning a blind eye to concubinage) and the right of people to read the Bible and to worship in their own language. 'Lollardy' was a pejorative term (meaning 'muttering') used to describe the radical teaching of the fourteenth century English theologian, John Wycliffe. In Scotland it had produced martyrs such as James Resby, burned at the stake in Perth in 1407, and Paul Crawer, who suffered the same fate in St Andrews in 1433. In 1517 things came to a head when, according to tradition, Martin Luther nailed his Ninety-Five Theses to the door of All Saints Church in his native Wittenberg. Luther's particular focus was the selling of indulgences which purported to reduce time spent in purgatory, with the proceeds funding the re-building of St Peter's in Rome. Thanks to the recently invented printing press Luther's ideas quickly spread far and wide. In Scotland they were embraced by people such as Patrick Hamilton who had studied in Germany and was martyred at St Andrews in 1528. Others took up the cause including George Wishart and his sword-bearer, John Knox. Wishart, too, suffered martyrdom but Knox, strongly influenced by John Calvin from time spent in Geneva, survived to achieve his goal when in August 1560 the Scottish Parliament rejected the authority of the Pope and outlawed the Mass. The following year things were complicated (to say the least) by the return from France of Mary Queen of Scots to assume her throne and adhere personally to the Catholicism in which she had been raised. The aim of Knox and his followers was reform, not the creation of a new Church. Indeed, there were those within the leadership of the pre-Reformation Church, who continued to serve, advocating change from within and giving leadership to the post-Reformation Church. Priests became ministers, bishops served as superintendents (ministers with a regional remit) and new structures were put in place, though it was not until 1592 that a full Presbyterian system was adopted by the Scottish Church and Parliament. This comprised an ascending series of courts made up of ministers and elders, namely, Kirk Session, Presbytery, Synod and General Assembly. Following the murder of her husband, Lord Darnley, and her marriage three months later to the Earl of Bothwell (suspected of involvement in the murder plot), Mary had come under pressure to abdicate in favour of her infant son, James. Her supporters rallied to her cause but, following defeat at the Battle of Langside in 1568, she fled to England where she was imprisoned by Elizabeth and finally executed in 1587. In 1603, on Elizabeth's death, the Crowns of Scotland and England were united under James. His aim was Church uniformity, on Episcopalian lines, north and south of the border. Consequently, during his reign and that of his successors Charles I and II, the Scottish Church alternated between Presbyterianism and Episcopacy. The Stewart kings were strong believers in their divine right to rule both Church and State but they had to reckon with the Covenanters who, in 1638, signed the staunchly Presbyterian National Covenant. Not until 1690, following the 'Glorious Revolution' was the reformed Scottish Church finally settled as Presbyterian, though more trouble lay ahead. In 1707 the Parliaments of Scotland and England united and it was not long before policies emerged with unsettling consequences for the 1690 settlement. In 1711 legislation was enacted restoring the right of patronage which had been abolished in 1690. This returned power to landowners and town councils to nominate ministers to vacant parishes, thereby removing the right of call from congregations. This was to become the source of much division in the Church over the next century and a half. In 1733, protesting at what they saw as the Church's acquiescence in patronage, a number of ministers seceded and in 1761 this was followed by a second secession. Meanwhile disagreements within the secession denominations led to further fragmentation. Gradually, as causes of separation receded into the past there was some coming back together; but then, in 1843, a far greater schism occurred. Known as the Disruption this resulted in approximately one third of ministers and congregations leaving the Church of Scotland and constituting themselves the Free Church of Scotland. The continuing denial of the right of call to congregations, along with the striking down by the civil courts of Church legislation as ultra vires, lay behind this dramatic turn of events. Ironically, as all of this was going on the descendants of the previous century's Seceders continued to re-group and in 1847 the United Presbyterian Church was constituted. Some hard-liners remained apart but, essentially, by the middle of the century Scotland had three significant Presbyterian denominations. In 1874 Parliament finally abolished patronage and this opened up the prospect of re-union, though that would take time and, again, be achieved in stages. In 1900 the Free Church and the United Presbyterian Churches came together to constitute the United Free Church which united with the Church of Scotland in 1929. The re-uniting of the Church of Scotland was based on two vital principles - (1) the Church's role as a national Church and (2) its spiritual independence in matters relating to doctrine, worship, government, and discipline. Both principles are reflected in a series of Articles Declaratory which set out the Church's constitution and form a schedule to the Church of Scotland Act approved by the Westminster Parliament in 1921. With regard to the national Church role it should be noted that the Church understands this in terms of service rather than status. The Articles refer to 'a distinctive call and duty to bring the ordinances of religion to the people of every parish of Scotland through a territorial ministry'. The term 'established' is not used, as it is in connection with the Church of England. Nevertheless, the Church retains some historic traditions. The Sovereign is represented each year at the General Assembly by a Lord High Commissioner, who sits in a throne gallery overlooking the Assembly, but does not enter the Assembly itself. While the Sovereign has no role in the government of the Church the Queen has personally attended General Assemblies in 1960, 1969 and 2002 and, when in residence at Balmoral Castle, she traditionally worships at Crathie Kirk. The Articles Declaratory also assert the Church's Catholicity and its Ecumenical commitment. While standing within the Reformed tradition the Church of Scotland also maintains its place within the One Holy, Catholic and Apostolic Church. On this basis, and mindful of Christ's prayer that all his followers should be one, the Church seeks to share with other denominations in Christian mission and service to the people of Scotland. Recent General Assemblies have also encouraged interfaith dialogue and the Church is a member of Interfaith Scotland as well as of the ecumenical agencies, Action of Churches Together in Scotland (ACTS) and Churches Together in Britain and Ireland (CTBI). The Articles Declaratory also emphasise the global task of 'labouring for the advancement of the Kingdom of God throughout the world' and the Church continues to set a high value on its relationships with partner churches in many countries. In 1966 the General Assembly recognised the eligibility of women for eldership and in 1968 the ministry was opened to women. In 2004 Dr Alison Elliot became the first woman installed as Moderator of the General Assembly and the first elder to serve as Moderator since the sixteenth century. In 2016 women represented a little over half of the eldership and approximately one-third of ministers.